K4P was the brainchild of a Vermont Christian, Dr. Henry R. Carse, who, at 18, left the United States, not wanting to be drafted into the Vietnam War. He moved to Israel and became a citizen. Having done his mandatory service in the Israel Defence Forces (IDF), he served in the IDF during the First Intifada (1987-1993). By the time of the Second Intifada (2000), he had been in Israel for about 30 years, was married and had four children. He wanted things to change so, with the help of some American friends, he created K4P, and the first camp took place in the States though Carse lived in Israel. In 2004, Yakir Englander joined the organization as a volunteer. He did so for a few reasons. A student at the time, Englander had grown up in Israel’s Bnei Brak area in a modern, Chassidic family. However, he left the Orthodox community at the age of 22. “I decided to leave my community with a lot of love … some criticism, but mostly with love, and a huge desire to find more ways to be connected to spirituality and the divine,” he said. When he left orthodoxy, he was drafted into the IDF, serving in an educational capacity, later spending most of his reserve time in a unit that had to identify dead bodies. In his first month of studies at Hebrew University, in Jerusalem, in 2002, a bomb exploded and he found himself carrying the bodies of students, some of whom were American. He said that he felt lost, as did “many other Israelis,” feeling that the way toward change was through meeting with Palestinians. “I went to a few meetings with different organizations,” he told the Independent, “but what I felt was that there’s this huge criticism of Israel in words and language that blames me. Yet, I didn’t have an opinion…. I didn’t know. It wasn’t just because I was Orthodox in the past. At the end of the day, there are many things we don’t know and also life is much more complicated. When Englander heard about K4P, he joined as a Jewish advisor, and then later as a director until 2012. The transition is difficult, however, said Englander. He said some of the kids lose their bearings after the experience. “They no longer knew what to do or how to act, as they no longer hated Israelis or Palestinians,” he said. In 2006, K4P changed to a year-round model. Throughout his time there, Englander continued his studies, culminating with a PhD in gender studies, sexuality and Jewish theology. His schooling led him to Northwestern University. He became a Fulbright scholar, and spent a year as a visiting professor at Harvard Divinity School. “During these years, I served as a vice-president for K4P International, working a lot on creating connections with many moms, rabbis, priests, government people, and doing a lot of lectures all over North America, including Canada,” said Englander. Last year, Englander, together with the board, decided to end his term as vice-president to instead lead K4P graduates. Englander created a new program for 18-to-25-year-olds, working with them to shift from a dialogue-only model to a dialogue-to-action one. For now, the program in Israel only operates in Jerusalem, due to financial constraints. “Last year, the U.S. Institute for Peace gave us a very nice amount of money, so we have enough now for all the families who join K4P,” said Englander. “When the kids have a meeting, the parents, too, must come. The Israeli chapter currently has about 150 kids, with the capacity to add another 65 new kids and their families this year. “Hopefully, by next year, we’ll grow by 80 new families,” said Englander. “But, we also need to take into account that we are building a new program for 18-to-25-year-olds, with 15 amazing, serious young people. Some of them are graduates from K4P and some have parents who would never [have] consider[ed] sending them for K4P – settlers who grow up in settlements – [but] something very deep broke in them last year. Englander said that, in today’s situation, Israelis and Palestinians do not generally mix in public places. 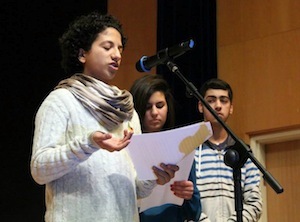 But, on Feb. 29, he said, K4P challenged that reality, having these young adults meet in a public space in Jerusalem. “So, this group of people with a lot of courage decided they [were] going to do it,” said Englander. “Half of the meetings are going to happen in public spaces … that we choose very carefully … spaces where normal people from east Jerusalem and west Jerusalem are going to see them in their public space – Palestinians and Israelis together, body next to body, and dealing with the crucial, most important questions. “We are planning to record and share these meetings,” he continued. “It’s very important to bring the voices and pictures to the world, to see how Muslims are opening themselves, how Jews are opening themselves – so they can see that it’s not just shalom/salaam, they care about their Jewish identities, their Muslim identities, their Christian identities … though they struggle with that, they still decide to work for peace.